As part of continuing Strip Appeal activities The CRSC recently hosted a Design Party to proactively re-imagine Petrolia Mall, Edmonton. The Strip Appeal Tour has kicked off in style opening at the UB Anderson Gallery on17th November! 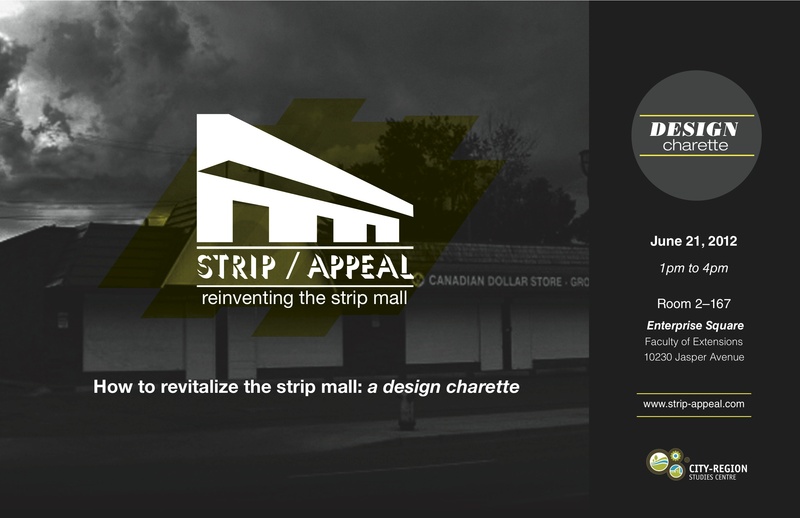 Strip Appeal: Reinventing the Strip Mall is an ideas design competition and traveling exhibit initiated by the City-Region Studies Centre (CRSC) at the University of Alberta intended to stimulate and showcase creative proposals for the adaptive reuse of suburban strip malls. At the CRSC, we believe it’s time to rethink our relationship with the strip mall. This touring exhibit offers creative reimaginings of the strip mall from the competition shortlist to inspire architects, developers and communities to adapt these ideas for their own neighborhoods. For example, the winning submission — Free Zoning — radically reimagines a derelict strip mall in Buffalo, NY as a building quarry. Proclaiming the site free of zoning restrictions, Davidson and Rafailidis deconstruct and inventory all the building materials on the site and demonstrate how these can be re-used to construct community housing. 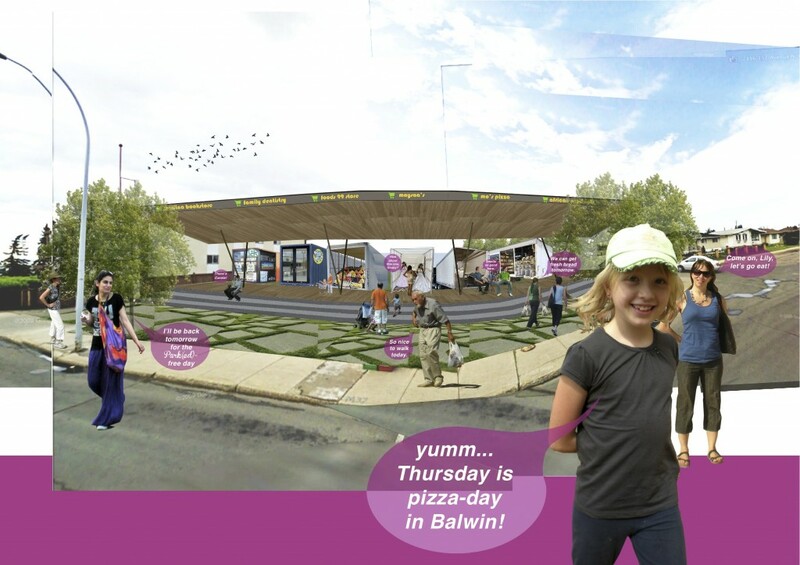 A hands on workshop to explore the planning, design and business implications of proposals for new approaches to suburban neighbourhood retail. This charette will help participants implement insights from strip-appeal.com, an international design competition to reimagine the strip mall. 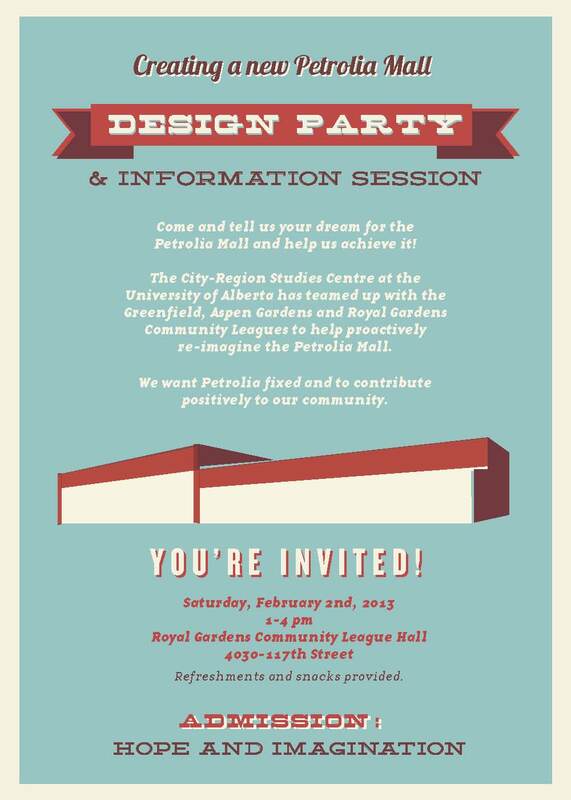 The presenters and facilitators have experience with urban design and retail planning. The workshop is offered by Dr. Rob Shields, the Director of the City Region Studies Centre, who has a background in architecture and is a leading expert and author on shopping malls and consumption culture, and Dr. Merle Patchett, postdoctoral fellow at the City Region Studies Centre and geographer with a specialization in material culture and new approaches to urban problems. This charette will be of interest to planners, developers, designers and architects, community organizers and those in retail businesses. A certificate of participation will be given. We are delighted to Announce the Winners of Strip Appeal. In this submission Davidson and Rafailidis take a derelict strip mall site in Buffalo, NY and show you how you can use the materials of the derelict mall to build a free-zone neighborhood. all building materials get demounted and sorted. They can be used for free for any new building activity on the site. The foundation is the most expensive building element to build as well as demolish. They propose to use the existing foundation as a seedbed for new construction. All uses are allowed. No zoning variances are required. In their proposal they show you how you could use salvaged materials from the derelict strip mall to build a series of small houses and over a 25 year period how new mixed-use neighbourhood could result through this fee-zoning approach. 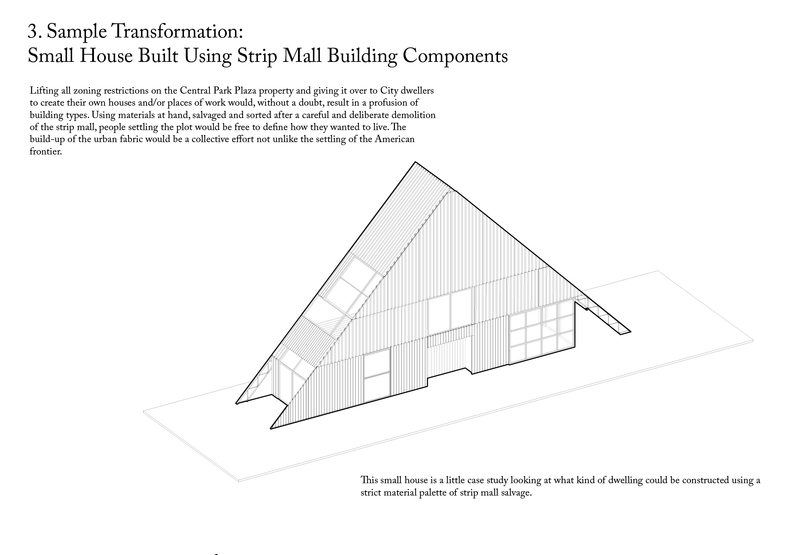 Given that 11% of Strip Malls are completely derelict in the U.S. this submission offers innovative and practical solutions for how to reuse the building materials of a such a mall to produce a sustainable neighbourhood. Park(ed) Mall takes 4 strip malls located in the north of Edmonton (Baldwin, Glengarry, Rosslyn and Lauderdale), and proposes to replace the static built strip malls in the four sites with a park and trailer dock which houses new mobile service trailers that are on a rotating schedule. Park(ed) Mall retains the commercial activity that vibrant neighbourhoods need, while removing the dependence on passenger vehicles, encouraging people to walk in their neighbourhoods. Ho does it do this? By bringing the stores to you! Rather than getting in a car to drive across town to find the store you need, the strip mall nearest you is replaced by a park. A docking station is located in the park to which specially customized trailers, the new homes of the stores in the old strip mall, pull up. The trailers hook up to the infrastructure, water, power, waste and telecom available in the dock and open for business. When not in use by the mobile shops the sites act as neighbourhood parks. As a remnant from the social ‘60s, the neighbourhood Wesselerbrink, located in the Dutch city of Enschede, is now dilapidated and became the place of refuge for lower income social groups. The need for social bonding is urgent and facilities for inhabitants are lacking.The now largely abandoned strip mall in the middle of the neighbourhood is perfect as location for a neighbourhood centre. From a monofunctional commercial building with strict opening hours, the building is redeveloped in order to host a wide range of activities; at different times and for different users. 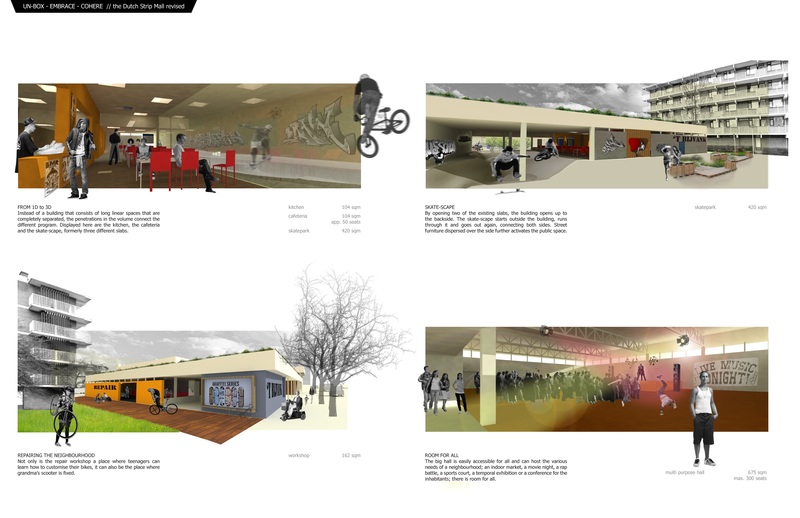 The architectural interventions that are made in the proposal are minimalized to those that activate the building in its surroundings and make it suitable for its diverse scope of users. The most crucial spatial intervention that is made is the removal of some non-structural walls to move from an alienating building that consists of a single volume, to an assembly of volumes. Suddenly the backside of the strip becomes another front side. Simple penetrations in every possible direction connect pathways and allow daylight to enter and embed the building in its surroundings.